St. Andrews Heights is a Calgary community in the NW quadrant that is home to the Foothills Hospital. It is north of the Bow River and south of 16 Avenue North. With an equal mixture of condos and houses, St. Andrews Heights real estate has a unique spread of styles. Here you can view all current real estate listings for St. Andrews Heights, and learn more about this NW Calgary community below. At the southwest corner of Crowchild Trail and 16 Avenue North (Trans-Canada Highway in Calgary) is the small community of St. Andrews Heights. It is bounded by an escarpment on the south side, which offers amazing views of the river valley. Communities nearby St. Andrews Heights are University Heights across 16 Avenue, Point McKay and Parkdale down the escarpment, and Briar Hill to the east. St. Andrews Heights contains the Foothills Medical Centre, a large hospital and medical research complex. The hospital is located on the western side of the community and the residential section is across 29 Street West. Since the hospital is accessed from the far western side, there is little through-traffic in the residential part of the community and it is a quiet residential neighbourhood. St. Andrews Heights has a mixture of detached homes, attached houses and condos, making the real estate ideal for students, hospital workers and families seeking a quiet but accessible neighbourhood. 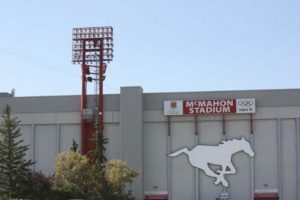 McMahon Stadium is home to the Calgary Stampeders CFL team. There are parks, playgrounds, tennis courts and athletic fields in the community. Shopping is nearby and plentiful, and the University of Calgary and McMahon Stadium (home of the CFL Calgary Stampeders) are very close by. The St. Andrews Heights Community Association has hall rentals, regular events and oversees a neighbourhood skating rink. Many Calgary Transit buses run to the Foothills Hospital and offer residents of St. Andrews Heights convenient transit options to downtown, the university and beyond. If you are interested in buying or selling a home in St. Andrews Heights, contact us today or get a free market value report. We were quickly drawn to Tanja and her personality at an open house she was hosting. After an honest meeting with Tanja, we informed her of the communities we are interested in looking into as well as the type of home we were looking for. She quickly learned our style in homes and showed us properties that fitted our criteria. Tanja was always honest with us during our tedious search, providing opinions and objective advice based on her own extensive experience with other clients. Throughout the process, Tanja was always looking out for our best interest both in buying and eventually in the re-sale. She understood our needs and wants as well as kept us within our financial boundaries.